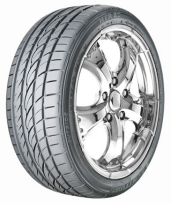 The Sumitomo HTR Z III tire is the company’s ultra high performance summer driving tire. Designed for those looking for the best in high speed cornering and handling, the HTR Z 3 does not disappoint at all. It features an asymmetrical tread design with silica added to the tread compound. The result is better handling and traction on both dry and wet road surfaces. The street legal Y speed rated Sumitomo HTR Z can be used on the street or at the track. This tire also has longer than normal lateral grooves that combine with wider circumferential grooves to make this tire handle well on wet roads, with better than average hydroplane resistance. The ride on this Sumitomo tire is smoother than you would expect from a tire in this class. The computer design has enhanced riding comfort and made for minimal road noise from the tread. Finally, tread life is extended due to the rigid tread construction with wider steel belts and a polyester cord body. Prices on the Sumitomo HTR Z tires ranges from around $95 for a 17 inch model, to upwards of $295 for the massive 22 inch models. Who Are Sumitomo HTR Z III Tires Designed For? Sumitomo has designed the HTR Z III summer performance tires for drivers of all types of sports cars, be it coupes or sedans, who are looking for an aggressive high performance tire that provides excellent handling and traction in a variety of road conditions. Sumitomo does not offer a tread wear guarantee on the HTR Z III tire, but we found that the tread life is quite good on this particular model. Sumitomo does provide a 5 year warranty on materials and workmanship that begins from the week the tire was produced. It includes a free replacement for the first 50% of wear, followed by a prorated amount down the final 2/32 inch of useable tread depth. A uniformity guarantee is also provided and it is good for the first 1/32 inch of wear.